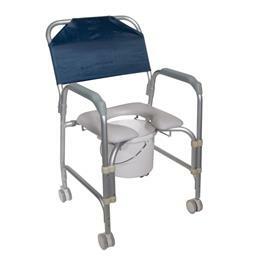 This lightweight portable shower chair commode with casters by Drive Medical is packed with features to ensure a pleasant and comfortable bathing experience. One of the greatest benefits is the ultra comfort padded seat, featuring an open front design making personal hygiene easy and convenient. When the shower chair is not in use the back and 12 qt. commode bucket can be removed without tools making cleaning and storage simple. The frame is manufactured with lightweight rust resistant anodized aluminum able to withstand a 300 lbs. weight capacity. Easy to operate this shower chair commode comes equipped with 3" non skid casters making transfer too an from any bathroom safe and secure. Arm Height (from seat): 8".